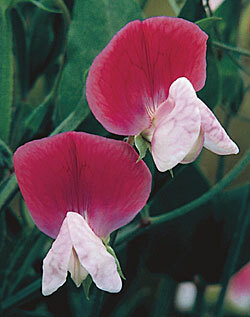 Annual sweet pea (Lathyrus odoratus) is a beautiful climbing plant for almost any garden. The real appeal lies in their fragrance. The flowers emit a sweet, honey fragrance that perfumes the air. 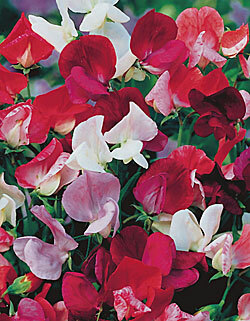 It is one of the most graceful and classic annuals, bearing pea-like flowers in a wide range of colors. 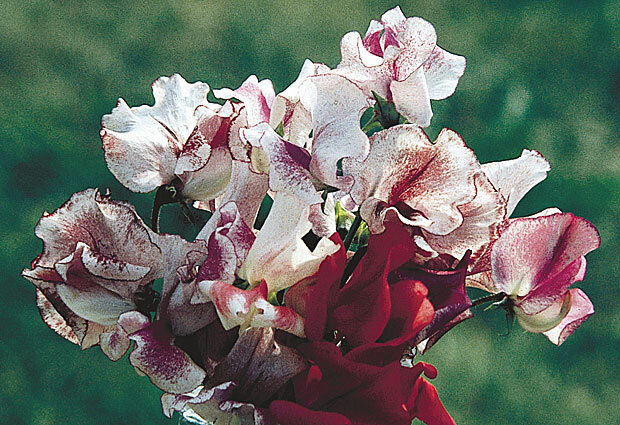 Sweet peas are a textbook example of the pros and cons in extensive hybridization. In 1696, the flower and fragrance of the wild sweet pea caught the eye (and nose) of the Franciscan monk, Father Cupani, as it bloomed in his monastery garden in Sicily. He shared the seed with a British plant collector who quickly distributed it throughout England where Lathyrus became quite a novelty. In the late 1800’s, breeding efforts resulted in bigger blooms, more colors, and interesting flowers that made sweet peas extremely popular. Many of these new “improved” varieties, however, lost their distinctive fragrance. The old-fashioned scented varieties became rare and were nearly lost. Now, both the attractive flowers and beautiful fragrance of Lathyrus odoratus are regaining popularity. 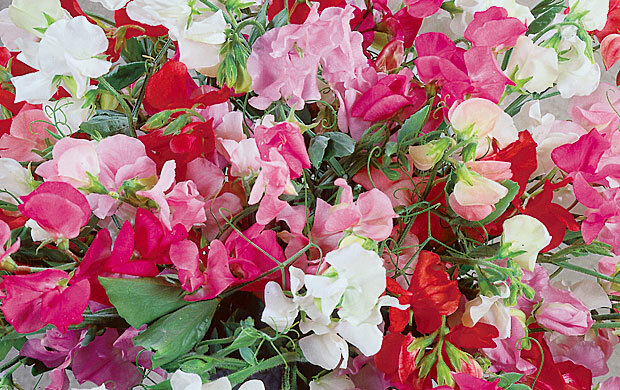 Most sweet peas will climb to about 6 feet by means of short, wiry tendrils. This will require support from a fence, wire, trellis, or even a shrub. In its native Italy, sweet peas were found growing along cool river banks, in open woods, and in pastures. There, temperatures were cool, soil was rich, and sunlight was strong. Therefore, avoid subjecting roots to dry, infertile soil and keep plants from overheating. Pinch off spent blooms to prevent energy loss to seed formation. This and proper cultural care will encourage flower production from summer until fall. Sweet pea’s beautiful flowers, wonderful fragrance, and good vase life make them a terrific cut flower. Their climbing habit makes them perfect for vertical gardening, but even without support, sweet peas can create a colorful annual underplanting between large perennials or shrubs. In containers, they cascade vigorously over the sides and can be controlled with some selective pinching to maintain a tidy size and appearance. Sweet pea’s delicate foliage and classic flowers are great companions for the popular obelisks and wire plant towers that ornament many of today’s gardens. Sweet peas are very easy to grow from seed. Plants may be started in a cool place indoors or planted directly outdoors when the soil is workable. Allow the seeds to soak for 36 hours and sink them 1 inch below the soil surface. Germination is reduced at temperatures above 75 degrees, so don’t wait until the hotter days of spring to get started outdoors. It is ideal to plant them in a cool location since peas do not perform well in high temperatures. Eastern exposure or protection from midday sun would be ideal. Although the antique varieties are difficult to find, they are available from some obscure sources. Some of the more fragrant old favorites include ‘Painted Lady,’ a pink and white bicolor introduced in 1737; the rose and pink ‘Blanche Ferry’; the deep maroon ‘Black Knight’; and of course the deep purple and blue flowers of ‘Cupani’s Original.’ Modern hybrids are less fragrant, but produce exquisite large flowers in separate colors that include shades of blue, pink, lavender, white, salmon, and scarlet. There are even dwarf bush types available that only grow 10 to 12 inches tall and can be used to create a unique border plant. Today’s gardener can use sweet peas to satisfy their desire for unusual plants, fragrant flowers, or old-fashioned gardens. Remarks: Uses tendrils to climb; train up pyramids made from bamboo poles and string, or trellises. Add organic matter to the soil for best results. Deadhead to prolong blooming.